I recently watched a strong woman in her late 70s step on the scale before heading to her water aerobics class, scold herself and mumble the words “not good.” She then shared with her friend that she had to get back on her low-carb diet. I wondered if she enjoyed a low-carb diet since this is not necessary if you are trying to lose weight. I also wondered what in her life would really be different if she did indeed lose a few extra pounds. If you have struggled with an eating disorder, chronic dieting or simply read a book or blog that encouraged you to follow a very limited diet full of lists of good and bad foods, this article is for you. Read on as I truth tell and combat some of the most common unnecessary diet rules. Confused if you should be following a low-fat, low-carb, sugar-free, gluten-free, paleo, vegan, raw or clean eating diet? Trends come and go. Watch the trends from the sidelines and choose not to jump on the bandwagon and participate in unnecessary food rules. The best diet is the one you will actually follow for life. I live and teach the philosophy that you can eat anything, just not everything; it all comes down to personal choices. You can find a diet that will villainize just about any food. There are no bad foods, only bad overall diets. You can actually create a lifestyle based on your health goals and overall food personality (i.e. what you enjoy eating). The key for success is understanding how to balance geeky nutritious foods along with soulful foods chosen exclusively for taste and fun. In our nutrition counselling practice, the scale lives in a dark closet and is only pulled out if absolutely necessary as a baseline or long-term measure over weeks of hard work (not days). Overall, the scale is not the best tool to measure daily progress or success since much of what moves people toward better health and achievement of their personal best weight has more to do with creating the systems, mindset shifts, emotional eating strategies and practical meal plans that include a good balance of healthful and also soulful foods. These very critical habits and skills may not show up as a reward on the scale right away, which means it can very easily derail motivation and continued progress. 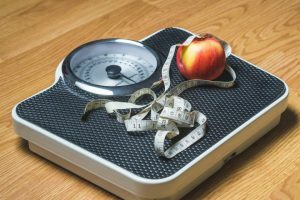 If you focus on the scale, the side effect will often be derailed motivation and sabotaged momentum with your meal planning and working through what, when, where and how much to eat since often things take far longer than you may want to admit. If you, however, focus on the things you can directly control such as the systems, meal prep and cooking skill, the side effect will be movement towards your personal best weight. While there is benefit in understanding approximately how much you are eating and what your body requires on average in a day, you do not need to measure food or track on an app to be successful. If measuring food and tracking on an app feels like you are on a restricted diet, work with an experienced dietitian who can help you find healthier ways to encourage progress without harming your relationship with food. If you choose to use an app or follow a set meal plan with specific portions of food, remember that you are not a robot. Your hunger and appetite changes daily and is not tied to how much you exercised today. You may be hungrier on a day that you were a couch potato and less hungry on a day you are more active. Exercise should never be treated as a reward to eat. If you are going to measure your food or track on an app, consider thinking of your plan in the context of a week rather than a single meal or day since relying exclusively on a set rigid meal plan or on an app dishonours your body and natural intuitive hunger cues. As a professional athlete I have found that the physical demands of my sport call for a very scientific approach to nutrition coupled with expert knowledge of sport-specific training routines. It was not until I begin nutritional sessions with Andrea that my objective of adding positive pounds (size and strength) in the amount of 15-20 lbs was realized. Moreover, I was able to achieve my goals in a much shorter time-span than I originally thought possible. Thanks to Andrea, and her professional, sport-specific advice, I have achieved my weight-gain objectives, which has in turn greatly enhanced my game – all without compromising my dietary restrictions.